At last some good weather. We decided it was time to get out for a decent walk as we hadn't done much distance this year so far. To pick somewhere to go we looked for the nearest geocach to home, which turned out to be in the village of Gedding. The route from Hitcham to Gedding is the way I drive in to work each day along nice quiet lanes, so we stuck to the roads to get there. It made quite a difference being on foot, seeing so much more of the surroundings. Of course it took a lot longer too! A little under 2 hours, compared to the normal 10 minutes. Once in to Gedding the GPS led us to a little church, which I have never been past before. The cache was hidden just a short distance behind the church on a footpath. It was easily found, and we dropped off one of our 'calling cards'. 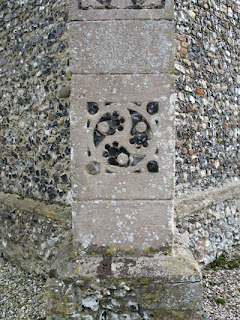 The church is very decorative, with flint inlaid in patterns. Looking from the churchyard you can also see Bill Wyman's house. We left Gedding, and then took followed footpaths to get to Bradfield Woods. Here we stopped for lunch, a flask of soup. It was freezing though, so didn't sit for long. We then decided to continue on footpaths to take a different route home. This way we also spotted a few deer in the fields, and also saw a bird with a long beak which we think must have been a Woodcock. Total distance in the end was just over 13 miles which felt like a good bit of exercise.